Drawing inspiration from the words of Robert Charles Lee, Yolanda Cornelius (franchisee of Just Property Zululand) can be described as “a force of nature, a very strong character, full of energy, unstoppable… unforgettable. In short, a person to be reckoned with”. Yet, she is also gentle, humble and warm. Perhaps this combination is what underpins her success? With 20+ years in bond origination behind her and Top Performer awards from market-leading institutions like Nedbank and ABSA, Yolanda has delivered on all sides of the real estate industry. She was therefore well equipped for the adventure she embarked on as a Just Property franchisee in November 2016. Yolanda is driven by a profound sense of service, the need to create the ultimate customer service experience. For example, she absolutely loves to be able to assist people to realise their dreams and being there every step of the way on each individual “Property Journey" going beyond the norm to serve her clients. In Yolanda, Just Property has an exemplary leader. She runs a very successful business, currently managing over 100 free-standing and sectional title properties and 306 sales listings from her Zululand franchise. Her colleagues at Just Property Zululand have taken their lead from her daily actions and the franchise office has demonstrated some phenomenal results in the past year; 140% increase in the number of properties sold and registered and 38 new leases signed. Their focus on world-class administration allows their landlords to confidently mandate them to R700 000 worth of monthly rentals. Adding to their list of accolades, Yolanda was recognised by Just Property Head Office as New Franchise of the Year and Yacoob Moosa from her Empangeni branch was recognised as the Rookie Agent of the Year, both in 2017/2018*. Yolanda carries an air of grace that comes from confidence in who she is and what she believes in. Her ultimate goal is to build solid relationships with people not only in Zululand but nationwide and to make a far-reaching impression through the positive actions that reflect who she is and what she believes in. What life experience has contributed most significantly to who you are today? My approach to Service Excellence has not been influenced by a specific life lesson or single learning experience, but rather by a combination of many experiences, challenges, industries, opportunities and amazing people that I have had an opportunity to work with over my 20+ year career. On a more personal note, my sporting career has given me the drive and discipline to excel on a provincial and international level with the ultimate achievement of being crowned World Champions for Action Cricket in the Masters Division. This has reflected positively on all challenges that I would face going forward. How did you get a break in your industry, an opportunity to do better? I see myself as an entrepreneur always seeking new opportunities. I was introduced to Just Property through the previous franchisee. Through the introduction, an opportunity arose for a new business venture into Real Estate and I made the decision to tackle this new challenge head-on. You now own a successful franchise, operating in a tough industry and depressed market conditions. What do you attribute your success to? As a new franchise, we spent a lot of our time analysing the market and also the individuals that move in those spaces. With extensive background knowledge from my Bond Origination career, we were able to shift our focus to the affordable housing market and to consequently generate a steady flow of income from these sectors. Being present, supportive and guiding each and every individual through any challenges that they may face. I believe that my relationship with my team can be classified as a partnership. Their success ultimately leads to my success and at the end of the day that is all I can really ask for. What is your biggest personal frustration? My biggest frustration currently boils down to people not taking responsibility for their actions. Want to know what’s happening in the Zululand property market? Yolanda and her team have the knowledge that only comes from living and working in a particular area. This is backed by insights that are drawn from highly credible data sources like Lightstone, TPN and Property24 that provide real-time information about trends in the market. Much of the information that the Just Property team has access to is not readily available to the public. Here’s what’s happening in Empangeni and Richards Bay. If you need a professional to help you “unpack” it or you are looking for more information (e.g. 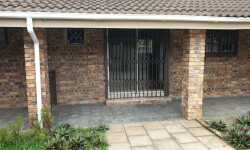 about the rental market or another town in the area), an agent at Just Property Zululand will be glad to be of service. The town of Richards Bay lies at the sea edge of an ancient floodplain, almost halfway between Durban and Kosi Bay and forms the tourist gateway to Zululand and Maputaland. Richards Bay began its life as a makeshift harbour, set up by Sir Frederick Richards, after whom it is also named, during the Anglo-Boer War of 1879. For many years, the town was little more than a sleepy fishing town until a hydrographic survey revealed that Richards Bay had even greater development potential than Durban. However, the transformation of Richards Bay into the country’s largest harbour and the world’s largest coal terminal only happened in 1976. Despite this, Richards Bay has some of the most spectacular wetland scenery and unspoilt beaches on the north coast of KwaZulu Natal. The Zululand Birding Route includes Richards Bay Harbour and the Game Reserve, known also as New Mouth, on its route. This part of the route covers sandbanks, mud flats, extensive mangroves, freshwater pans and forest areas and bird watchers can spot a number of rarities such as the cuckoo hawk and pygmy goose. New Mouth features a number of aquatic birds as well as hippos and crocodiles. Richards Bay is also fairly close to Gauteng and serves as a sea destination for many who want to escape the city life. It is a vibrant town that now actively markets a new concept in tourism - Industrial tourism. Groups in town for business are able to visit industrial plants, mines and other operations, particularly relevant for Richards Bay as some R1-billion is to be spent on expanding the export capacity of the harbour to 92 million tons of coal by 2008. Richards Bay has excellent recreational facilities and visitors can enjoy art galleries, fishing, beachcombing, bird watching, surfing, swimming, canoeing as well as some wonderful drives in and around Richards Bay. One such example is inland from Gingindlovu to Eshowe, via the Nkwalini Valley to Empangeni - a gorgeous drive. Suite 10, Partridge Place, Cnr of Tassleberry and Lira link, Richards Bay, KwaZulu-Natal, 3900. Spreading the love this Valentine's day <3 Wishing all our loyal clients a love filled Valentine's day! Give us a call for all your property needs, Sales & Rentals, we do it all!